The first time someone drew my avatar. SPUFer c313 traded this art for a Humble Bundle code. 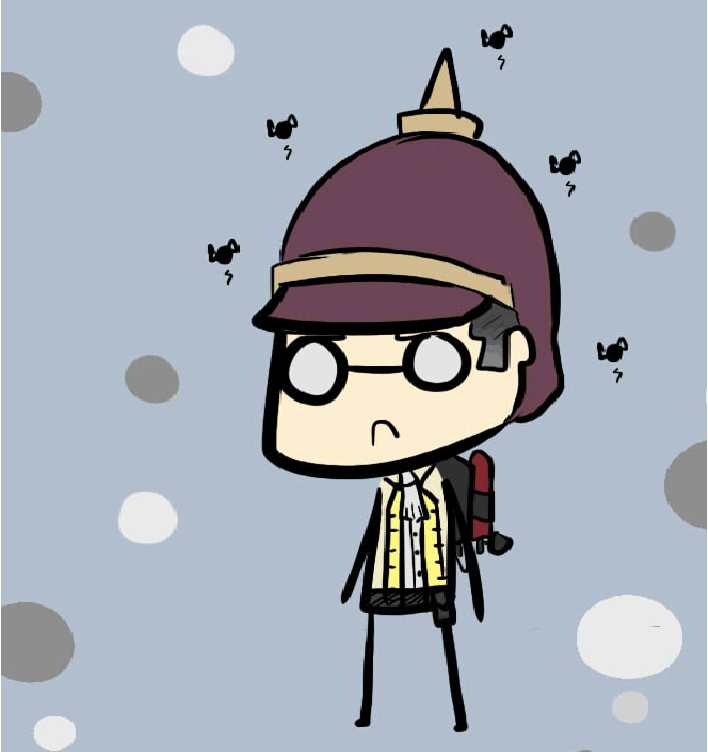 As I mentioned in a previous article, I am very particular with the cosmetics I chose for my Medic wardrobe. As a matter of fact, I can walk through my old screenshots and watch my outfit evolve as the various parts came together and at no point have I removed a piece. So I thought I might dedicate an article to each piece of the most beloved outfit I’ve ever owned in a video game. 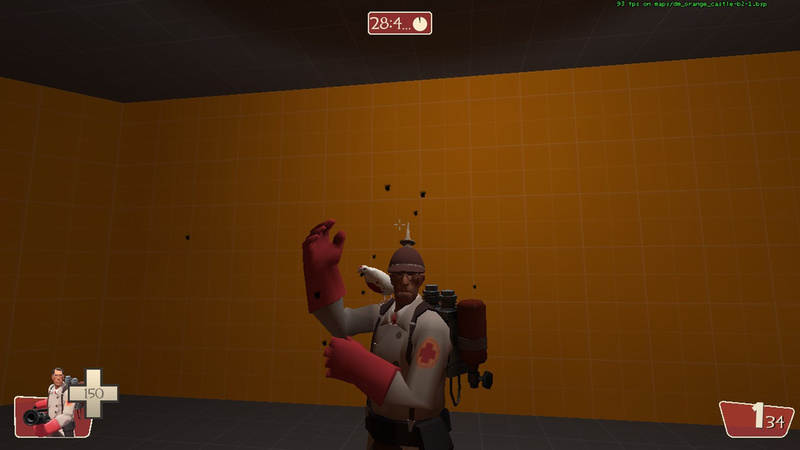 My oldest Steam screenshot of my medic was from 2012 when I played on an ultra-toaster! It wasn’t until the Archimedes plush came out during the Mann vs. Machine update that I obtained a Genuine Archimedes after buying the plush for said girlfriend’s birthday. 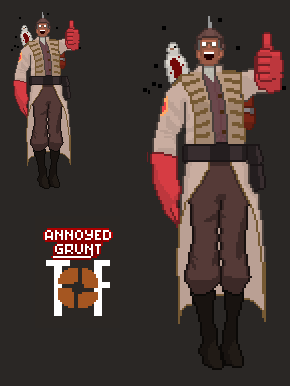 I adored his character from Meet the Medic, and he also came with new unprecedented facial animations; Archimedes will smile, talk, and generally parrot the Medic’s expressions on the battlefield. But even then, my third cosmetic slot remained stoically empty. I finally made my last cosmetic decision when the Foppish Physician was added to the game. 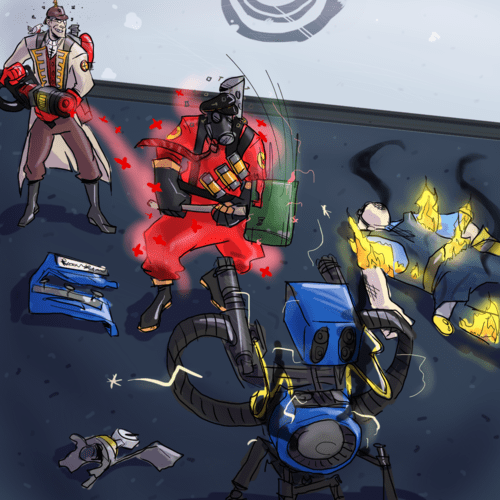 Back then, cosmetics weren’t the anything-goes smorgasbord they are now, and the Foppish came in the very first batch of cosmetics that dared to replace almost the entire character’s body. This attracted me because it meant I could cover a lot of ground with a sigle cosmetic, plus it went with the Picklehaube by turning the Medic into an old-fashioned militaryman, especially with the ‘epaulettes’ style. When it was first added to the game, the inner shirt was white, but a later update made it team-colored and I honestly preferred the white but I never could justify buying white paint for such a minor reason. I did end up throwing Halloween paint on it that my friend told me looked white, but totally doesn’t. Oh well, it gets me in the seasonal spirit. But I didn’t want just any Foppish; my Medic had an Unusual hat and a Genuine bird, I wanted to complete his outfit with one more special quality, and ultimately decided to try and secure a Foppish with a craft number. 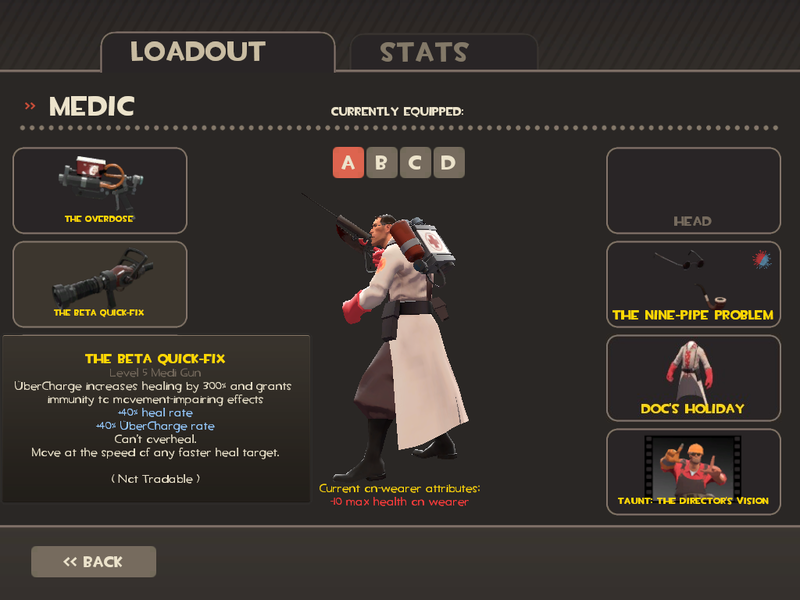 It cost nine keys, but I obtained the Foppish Physician #49 after a few days of trawling the TF2 Outpost. It was even Level 25, my lucky number. I later added Jack, the guy who crafted it, and I think we’re still on each other’s friends list. Picture by Phovos. 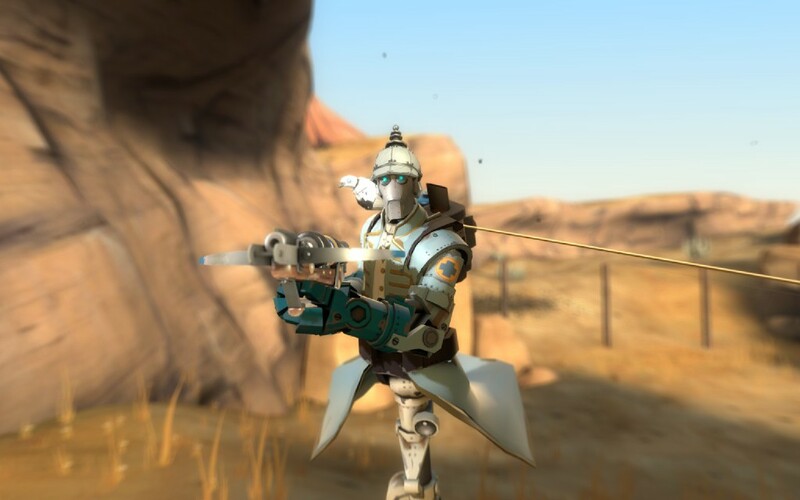 I’m holding the corpse of my medic from the TF2 Beta, in memory of said beta being deleted from Steam. And that’s where my loadout ended its evolution, unless Valve ever adds the mythical fourth item slot. I’m not even sure what I’d put if they did, I’m pretty satisfied with my medic’s bling. After countless years of Daily SPUF articles containing my current loadout of choice, I’d have to think long and hard before changing anything for any reason.